When I spoke to Jordan last week, she told me that everyone in the group is eager to come to Pittsburgh and based on her visit last summer there are many reasons that Pittsburghers should meet our Columbus counterparts. 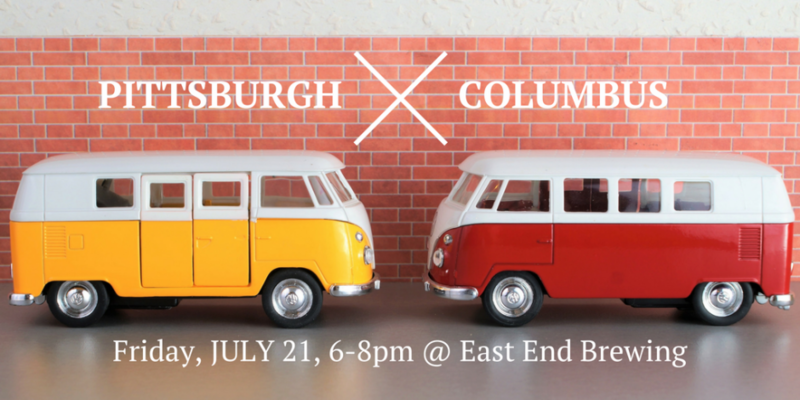 Consider this your formal invitation to meet our new friends from Columbus. All are welcome to attend the happy hour on Friday at East End Brewing in Larimer. Please take a look at the delegation members below and share the Facebook event with any other Pittsburghers who might be interested in attending. Here is the official blurb on the Create Columbus Commission which sounds quite similar to some of the projects that have taken place to help Pittsburgh grow into the thriving city that you see today. The CCC believes that the City of Columbus will be better positioned to attract and retain talent if there are YPs at the decision making table co-creating a forwardthinking city with a vibrant, accessible, and integrated urban environment that is a magnet for talent.